When I am thrift shopping I always look for antique and vintage things that are handmade. Generally, the quality and materials are better than anything you can buy new. Knit sweaters and mittens, embroidered pillows, crocheted afghans, needlepoint and crewel work and more. When I was growing up my mom was always working on some such project, in between making clothes, and I know the tremendous amount of time that is involved in each creation. It is more time than I am willing to put into any one craft but I truly appreciate every one-of-a-kind work-of-art I find. 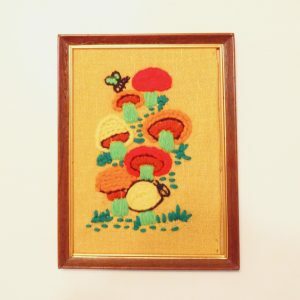 The other day I found two pieces of groovy 70s Crewel work, which is embroidery with a wool yarn. They looked very sad lying there along among the teddy bear posters and framed country scenes, they had to be saved. I am sure both pieces were made by the same person because of the colors and the very unconventional way they were mounted and framed. 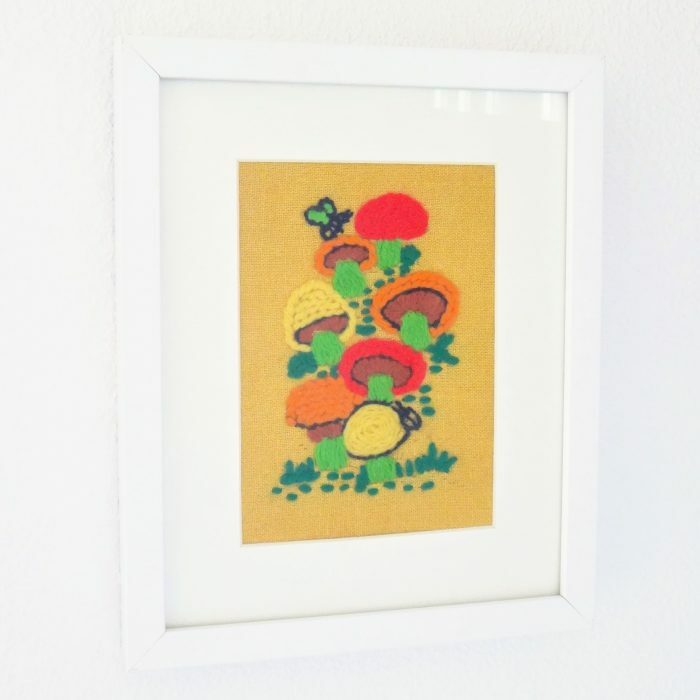 The first one, seen on the left here, is a small piece with mushrooms, a bee and a snail = 1970s cute. It cost 49 cents. Once I got it out of the “frame” and removed the layers of ancient tape and staples, I plunged it into cold water to clean off decades of dust. Then all it needed with a good pressing with some steam to look super crisp and like new. A simple white frame was the perfect way to keep it looking modern. I got an IKEA frame from my stash (I always grab imperfect frames at IKEA from their “seconds” area) and it looks great, as you can see below. It will be a great addition to the playroom walls. The second piece will take a lot more work to get it rehabilitated, more on that soon.